Happy New Year 2015 to you all, may your year be full of wonderful things, peace and harmony, opportunity, everything you would wish for yourselves. We invite you to celebrate with us because last week we admitted our 500th child into the nursery, a remarkable achievement by all involved. Here they are; our new recruits. 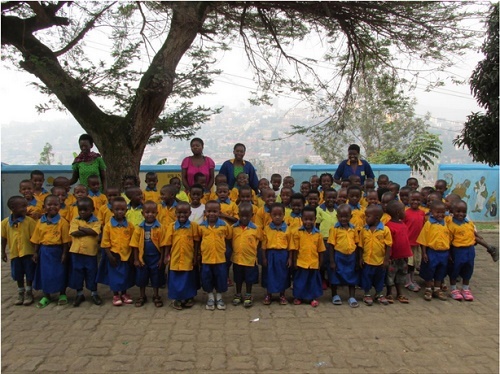 The staff are now very experienced and organised and the children settled really quickly, a few tears during the first couple of days but then it was down to ‘studying’ as they say here – ‘Meg, ndashaka kwiga’ I want to study. I hear that so often when walking around the area. 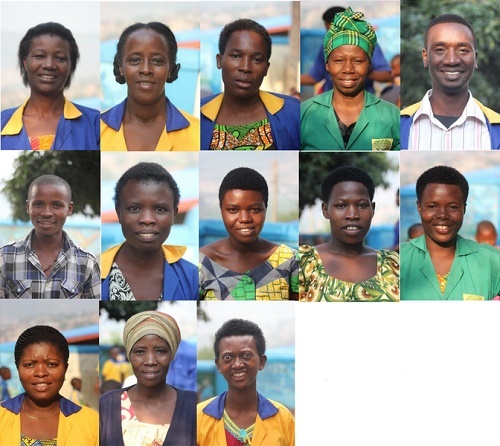 On behalf of everyone here in Rwanda I offer a very grateful thank you to our gallant band of supporters without whom we would not be able to do this. You are too many to name in person, but thank you to our trustees and to Ken who manages the website, to the sponsors who support individual children from nursery to a growing number in secondary school, to the people who organize fundraising events, to schoolchildren and staff in Cumbria, to our colleagues in America, to our team in Australia, to our volunteers here in Rwanda, and to individual donations from so many people, to those organisations who donate and support our fundraising. I feel sure that I will probably have missed someone somewhere but you know your support is highly valued. And a personal thank you to my long-suffering sister who manages all my logistical tasks, not easy! To our wonderful supporters who donate materials and humanitarian goods to help the people here, we all say thank you very much, you are making a difference to lives in Kinamba. Finally, nothing would happen here without our wonderful staff who work tirelessly for the children, and who spare no effort on their behalf. Kind, cheerful, ever willing to learn, they are a wonderful team. Looking forward to the rest of the year and new challenges.